Silksinger picks up where Blackbringer left off, and expands on it. Taylor’s faerie-inhabited world is full of bright colors and half-forgotten history, petty jealousies and firetime stories. Our heroine Magpie is still scruffy and foul-mouthed, questing with crows. 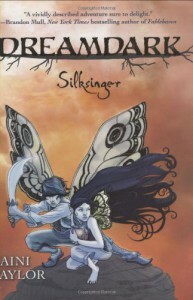 In Silksinger, we’re introduced to Whisper, quiet, lonely, and desperate; and Hirik, elitist, awkward, and determined to right a millennia-old wrong. They’re fully fleshed-out, flawed, and lovable characters, and their emotions reverberate throughout the book. The plot itself isn’t treading new ground, but it’s serviceable and it allows a natural exploration of the world and its history as well as the characters. If I had to quibble with such an enjoyable read, it would be that the more we explore the world, the more questions I have: each faerie clan has a particular magical ability and often distinct physical characteristics, but how do they work out in interbreeding? Magpie’s clan is Windwitch, but does that date to her grandfather the West Wind or does it go back further? What is the intelligence level of devils, and how does their intelligence interact with their instincts and pervasive hunger? Luckily for me, there’s plenty of room for sequels and more exploration, so I may yet get answers to my questions.